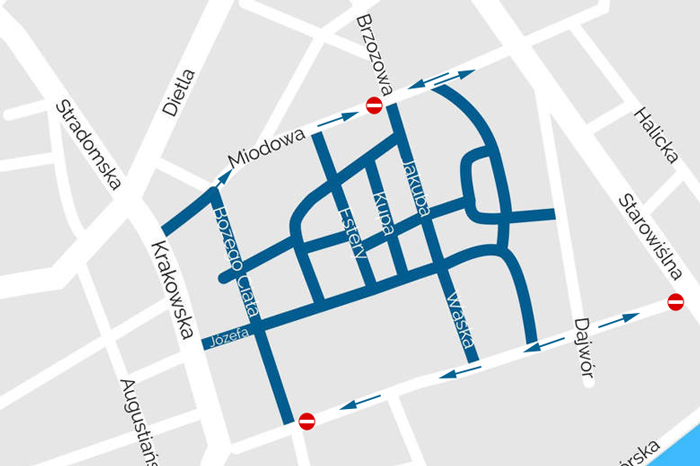 New traffic restrictions have been introduced in the centre of Kazimierz with effect from today (5/12/17), as part of extensive changes to parking and traffic systems across the city. A number of streets around Plac Nowy will be closed to general traffic and only night time (2000-0700) and weekend parking will be allowed on ul Dietla. Access to the streets marked blue in the map shown above, will be restricted to residents, deliveries, taxis, hotel guests, authorised service vehicles and ZIKiT permit holders. Miodowa will now be one way in the direction of Starowiślna – between ul. Bożego Ciała and Brzozowa. The section from ul. Brzozowa to Starowiślna will remain 2 way. Sw. Wawrzyńca will now be one way from ul. Dajwór towards Bożego Ciała and from ul. Dajwór to ul. Starowislna. ul. Halicka will now be one way from – ul. Przemyskiej towards ul. Miodowej. Link to an interactive map of changes. The city wide review of parking and traffic management, has lead to confusion and protest in equal measure. This is sure to catch out a lot of drivers, who are likely to automatically try to enter the now restricted or new traffic direction streets, risking fines or accidents, or worse, coming bumper to bumper with an angry Polish taxi driver! ZIKiT explain that the restrictions were needed to control traffic and parking. Special services – municipal, medical etc.